This week I was reminded about just how much Unity Gardens means to this community. We get all wrapped up in hosting classes, doing events, and holding fundraiser that every once in awhile its good to hear from our community its makes all the hard work worth it. Two story's from this week were very touching. The first was from a volunteer working in the evenings out at the LaSalle Square Unity Garden. She relayed the story to me, and trust me the more time you spend in the garden the more you learn. Among the many visitors enjoying the garden there was one lady worried about us taking down the garden early because she has got such good use out of it . She was either unemployed or underemployed and the garden had supplemented her meals so that she could feed her family complete healthy meals. What a confirmation of the good that can be done. My story for the week was somewhat similar but very different. Whether this sounds good or bad the expectation is that of course we need gardens on the urban west side of South Bend because the unemployment rate is high and the need is high. Well I disagree people have problems everywhere, and most of us are just one step away from being homeless. So my story is from the far south side of South Bend at the South Field Lake Garden on Miami Rd just South of Kern. I was there and I noticed a thank you card in a plastic bag stuffed behind the sign. I read the note. It was from and unemployed woman who used the garden on a regular basis to help keep her head above water. She went back to school and is searching for a job. Sometimes when we fall on hard times or just are having a bad day its makes us feel part of a community just knowing that someone we don't even know is willing to plant a garden just so our day can seem a little brighter. Now we know that there is more to growing a community free healthy food in the garden is just a band aid. That why we teach people how to garden. What could make you feel better than to grow your own healthy food ? We teach classes on preserving your harvest. How good does it feel to taste the fruits of your labor in January ? 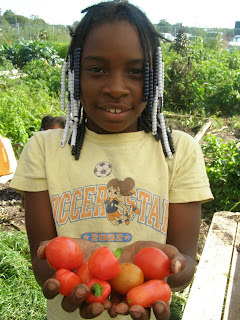 We teach kids programs because they are our future and have lost contact with how their food is grown ! We teach healthy cooking classes because it feels good to cook a meal from your garden. We hold a 5k run and a bike tour because we know good exercise habits grow a healthy community. We offer community plots so if you do not have the resources to grow a garden we can help. Its all one giant puzzle we must piece together to build the strong bones of our community. We love our community.
" We are growing more than vegetables "
Wow! Definitely a great post. Thanks a lot for the nice page.